While in LA last weekend, I took full advantage of the warm weather and pulled out some pieces that are sure to be some of my biggest Summer favorites when it comes to outfits. 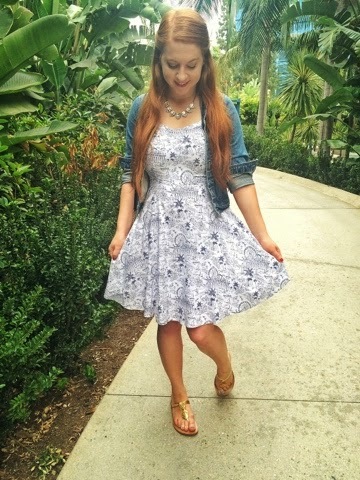 This patterned fit and flare dress from Old Navy is probably one of the cutest dress I have ever seen. It is super light and airy and has an awesome beach boardwalk pattern in blue all over.The v-cut neckline and the full twirl skirt gives it that extra feminine flair. I paired the dress with a necklace from my current Rocksbox set, a Perry Street crystal necklace. I threw on a vintage Jordache jean jacket that I have had forever, just to make sure I stayed nice and warm. I am completely enamored with this pattern. It just makes me think of the Santa Cruz Beach Boardwalk in summertime with the warm Summer sun on my face and the sound of lapping waves (totally soothing right?). For footwear, I pulled out these adorable pineapple sandals that I was able to snag a few days after the Lilly Pullitzer for Target collection launched in April. There was only one pair left and it was in my size so I figured it was a sign that I had to get them. I wore them all day and they were super comfy, no blisters for me. Plus, I couldn’t help but smile at them every time I looked at my feet. I mean, they’re freaking pineapples?! So cute. 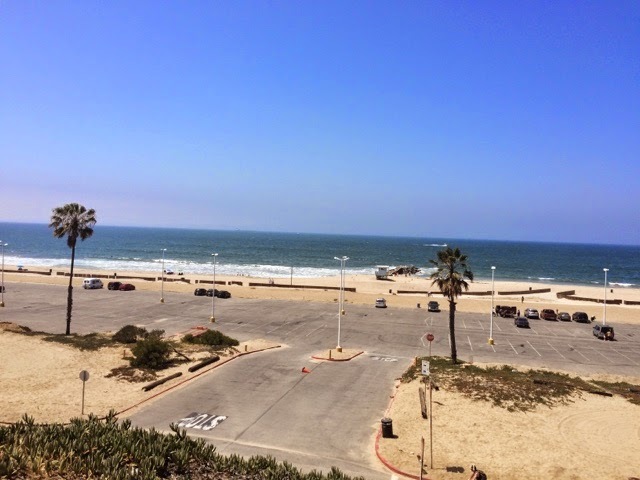 We spent part of our afternoon driving by one of the many beaches near LAX, enjoying warm sun and cool marina air. Sometimes, we all need a bit of relaxation like that. I love the print of the dress and our sandals are adorable! That dress is adorable! 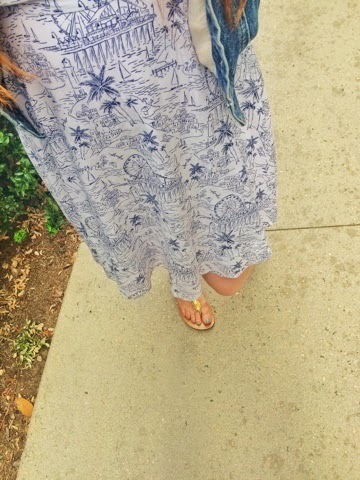 I have been living in ON dresses and jean jackets the past few weeks! I love Rocksbox too! Loving the entire outfit! easy and cute dresses like that are my favorite for summer! That dress is adorable! And I love the gold sandals. cute dress! I've been so impressed with Old Navy's summer line; I went there saturday and found some really cute things! What a cute look – those sandals are just adorable!